What’s so special about the gloves shown above? They’re made of synthetic materials — microfiber, specifically. No leather whatsoever. They’re made by a Cooperstown company called Carpenter. Some minor leaguers have been using them for a while now, but they’ve never been used in the bigs. That will change this afternoon, however, when Brian Gordon — a journeyman pitcher just signed by the Yankees — takes the hill in the Bronx. According to Carpenter, this will mark the first instance of a leather-free glove being used in a major league game. Blasphemy? Progress? Ho-hum? You be the judge. New ESPN column today, featuring reader-submitted proposals to redesign the team formerly known as the Thrashers. You can take a sneak peek at all the submissions we received here. By coincidence, yesterday I received a fairly polished Thrashers-rebrand proposal from two professional designers. It arrived too late to be part of the ESPN contest (I’m not sure the designers even realized I had issued a call for entries — I think they just whipped something up on their own and sent it in for me to see), but you can see what they came up with here. Uni Watch News Ticker: The new Bills helmet looks pretty much like we all knew it would. ”¦ Outmania, gold jersey edition! Damn that looks good. ”¦ The sports world’s reigning diva is, well, still a diva. ”¦ Impressive attention to detail: Someone on Etsy is selling a crocheted gall bladder — with tiny removable crocheted gallstones (great find, Kirsten). 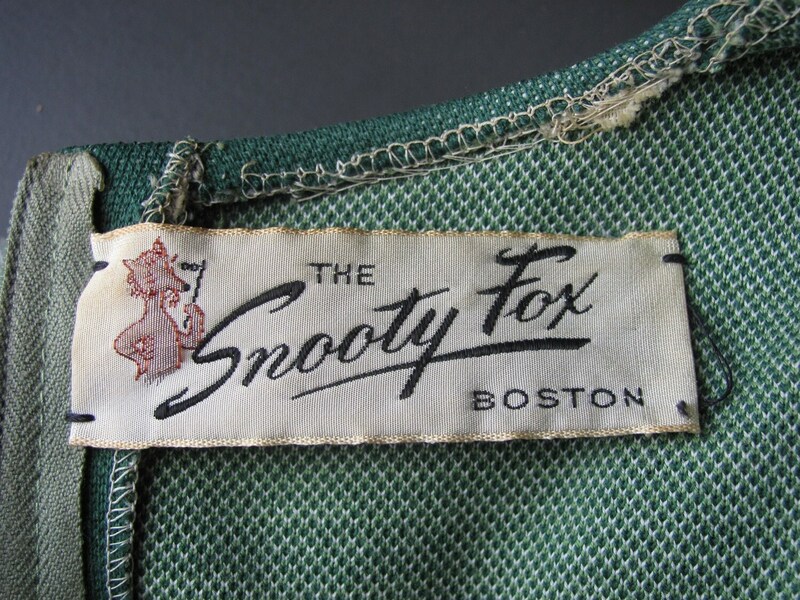 ”¦ While looking for something else, I came upon an all-time great clothing tag. ”¦ Good article about the Chargers’ equipment manager (with thanks to Leondrus Elijah Thornton). ”¦ Adam Yarnevich reports that the on-field photographers covering the CONCACAF Gold Cup soccer tourney are wearing Nike-branded pink pinnies. “There’s also a large swoosh all by itself on the front,” he says. “I don’t think I’ve ever seen a Nike- (or Adidas-, or Under Armor-, etc.) branded photographer pinnie before.” ”¦ Small item toward the bottom of this page indicates that the Predators will be unveiling new uniforms this summer (with thanks to Matthew Robins). ”¦ Here are Roger Federer’s Wimbledon sneakers (with thanks to Kenny Loo). ”¦ Darren Rovell’s rubber-stampery of the sports world’s corporate industrial complex continues apace. Latest case in point: He thinks this is a “nice NBA ad.” Sigh. ”¦ The Rochester Red Wings will wear Twins uniforms tomorrow (with thanks to Joseph Lombardo). ”¦ Was there a single high-cuffed player in yesterday’s Dodgers/Reds throwback game? Sure wouldn’t know it from these photos. “Has to be one of the worst-looking throwback games ever,” says Phil. ”¦ It looks like Shane Victorino’s double-flap helmet may have saved him from an injury last night (big thanks to Jim Walaitis). ”¦ With Bob Melvin taking over as A’s skipper, Sam Lam found a Melvin bobblehead from his days with the D-backs and repainted it as an A’s bobble. ”¦ A certain corporate logo is closing in on its 40th anniversary. Can’t say I’ve ever seen a batter getting beaned by the catcher. That can happen on the base paths as well. Even though I only bat lefty, I’d wear a double-flapper if given the chance. Microfiber glove… visually… who cares? They already make the leather ones in pretty much any color you’d want… or pink. The real question to consider is whether or not a microfiber glove provides any advantage over leather. Does the ball react differently – more likely to stick or more likely to slide out compared to the normal gloves? Bill Bray pitched the 8th and usually goes high cuffed (socks, not stirrups), but I haven’t found a picture yet. Sure enough, but he just wore red socks, not period-appropriate red/navy. 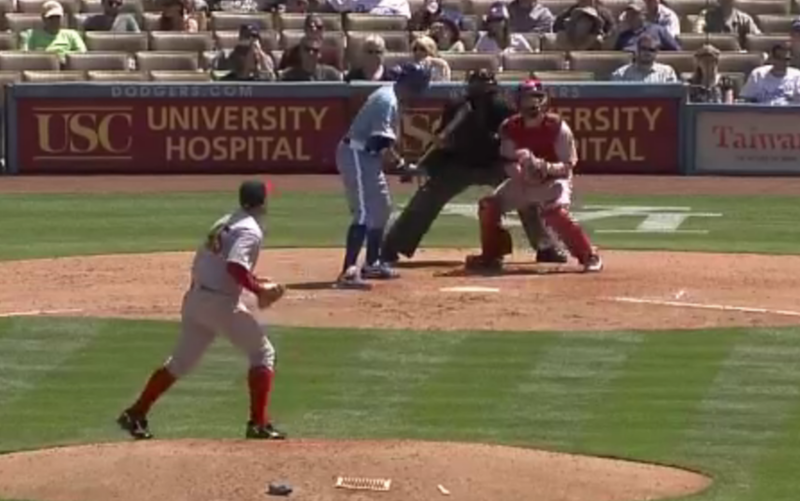 As you can see in the first link, James Loney of the Dodgers wore stirrups. Good for him! Despite the absentee socks, those Cincy unis looked really good. They should really swap for a red hat and adopt that set full time. Ditch. The. Black. As a Reds fan, I completely agree. It was nice the see the vertical arched block “CINCINNATI” across the jersey instead of the font on the normal road jerseys. Disappointed in the lack of red/navy stirrups though. I wonder if Mike Leake wore them? He’s been wearing stirrups since getting called back up from AAA. I wish he’d have pitched this game. Let me correct myself. The jerseys yesterday featured a radially arched “CINCINNATI” across the front, unlike the vertically arched jerseys worn by the Reds from 1961-1987. Good lesson in vertical arch vs. radial arch. As the Reds currently use black (as opposed to the first few years of the 2000s) I don’t mind it. My only suggestion would be ditch the black-brimmed road cap. It’s fine as an accent color. The last thing professional sports needs (and most especially baseball) is more blue and red teams. The Reds have used black in their uniforms since 1999. When the original Reds jerseys were debuted at RedsFest, the lettering on the front was about 1/3rd taller than what is on the front of the jerseys now. Same with the numbers. They were larger and they looked much, much better. I think Plan B Branding struck out this time. It looks just to minor-leagish to me. They should go back to the early 1990’s look with the vertically arched red CINCINNATI trimmed in white and ditch the black. And, those baggy uniforms just look bad on regular uniforms and exponentially awful on throwbacks. I am always very amused by the long conversation threads like yesterday’s regarding mask color on NFL helmets (the conversation born of the Bills helmet leak). I like to consider myself as much a unifreak as 90% of those who visit this site, but have to admit, I couldn’t tell you the facemask color of ANY NFL team past, present, or future. As long as the mask isn’t a color that obviously goes against the team’s color scheme, is it that important? In no way am I questioning those who feel strongly about the facemasks. We all have our thing here. But are there others like me here, to whom the facemask colors don’t really mean anything? It’s funny… that’s *exactly* why I’m against gray masks on most teams. If it matches the team’s color scheme… I don’t really care. It’s when it doesn’t that it bothers me. The Bills facemask could be blue, red, or white and it’d be fine. But it’s gray, and gray matches nothing. Funny thing is, I agree completely with The Jeff’s reasoning, which is why I actually favor gray masks. Culturally, grays is traditionally considered a neutral colors. (See also Baseball, Entire History of, Ever.) I’m all for color-matching facemasks. But since gray is a neutral color, it’s also a perfectly valid choice. It’s the equivalent of teams that don’t regard white as a team color outlining their logos in white. I’m much more bothered by the proliferation of teams that wear white helmets than I am by gray masks. A gray mask on a football helmet is no different than a white logo outline on a baseball cap. But a white helmet tells me that white is that team’s primary color. Which, with rare exceptions, it’s not supposed to be. White is every team’s color, if they want it. Even if they don’t, not every shoelace, band-aid and buckle needs to be a “team color”. White is effectively neutral, because the league freakin mandates that every team has to have a white jersey & white socks. Gray stopped being a neutral facemask color when it ceased to be the only color available. And why the heck can’t you have all the little things in team colors? Call me what you want, but it makes far more sense to me for, as an example, the Vikings to wear white shoes with purple and yellow trim instead of black. No, they don’t. Neither need the facemask, if a neutral color like gray is available. So tell me Chance, how would you feel about black facemasks? That’s also a technically neutral color. Black is not a “neutral” color in a sporting context. It’s the primary color of many teams. Were it not, then you could make a case for it. I don’t think facemask color is that important. Plenty of MLB teams play with brown baseball gloves, even though brown is not a team color. The results of the Thrashers contest are wonderful. Sure, more than a few submissions were hackneyed eyesores. But many were inventive and attractive and, besides, it’s a testimony to UW and its editor that the contest generated such a flood of DIY creativity. My own entry got lost in the mail, apparently. I haven’t looked at the ESPN column yet, so I don’t know which ones Paul decided to feature. There were so many good designs, but my top three: 1) Joe Csikos’ Owls; 2) Justin Morrison’s Falcons (logo and the wheat-gold unis); and 3) Tim O’Brien’s Falcons. Yeah, he’s a UW regular and an Irish homeboy, and so I’m prejudiced. But his stuff is good, yo. i was out for a week. where were the concepts posted? oh my!!! in all, i passed that ‘graph right up! LMAO!!! in all “my excitement to see the fairly polished Thrashers-rebrand proposal from two professional designers” i passed that ‘graph right up, that is… scrolled up to see what exactly paul typed and accidentally hit submit… done for the day, thanks guys! Wow. I totally missed that, too. I’m glad to see that I’m not the only one who thinks “Owls” would be a good nickname. In a first quick scan knee jerk reaction to the submittals, I’m glad I didn’t find time to send one in. I’d have just embarrassed myself. There looks to be some real standouts! And I too like “Owls” or some variation of that nickname as well. I always thought the “Thrashers” name was skateboard related. Wow…thanks for the positive feedback. I felt that it turned out pretty well, but I may have done different primary colors after coming to the realization that the Canucks wear a very similar color scheme. Can’t wait to see all the entries when I get home. My office connection doesn’t like flickr at all. Love the Winnipeg Whalers concept. A good tweak would be to change the bottom center of the whale’s tail to a point, and correspondingly the center of the W to a wedge, to convert the negative-space “H” into an “M” (for Manitoba). The A’s look great in that green and gold combination, socks and stirrups included. That has to be one of the best uniforms in baseball, but I’ve hardly seen them wear it this year. 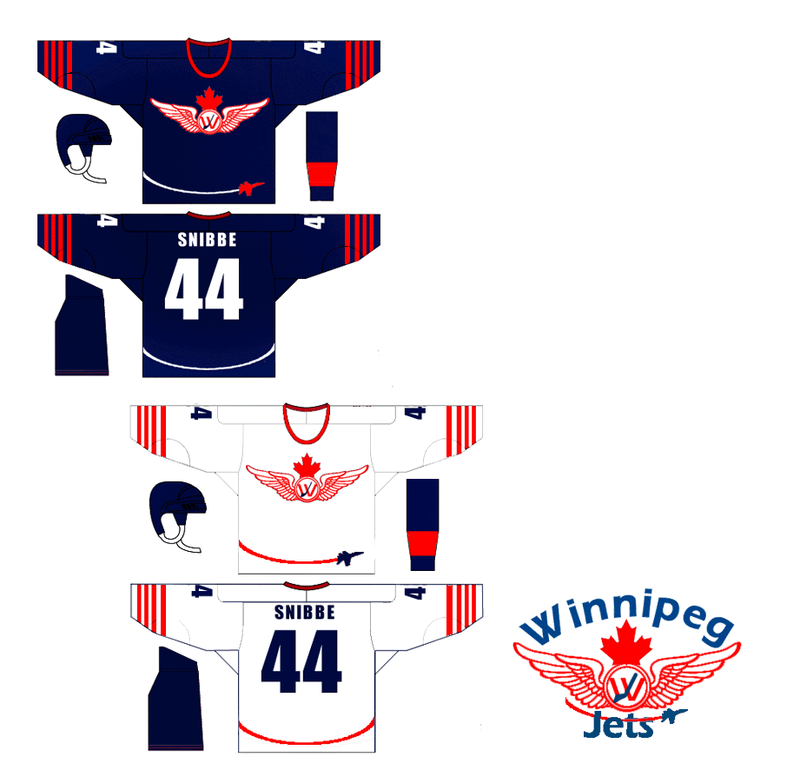 The pro submission for the Winnipeg Jets would be made *so* much better if the stylized jet were of a Canadian aircraft – e.g. the Avro Arrow or a Bombardier. With the Bills going with white helmets that gives the AFC East 3 out of 4. I also think this give the AFC East the best looking uniforms from top to bottom. Am I the only one who likes to think of uniforms and divisions in such a way? I think I’d go the other direction. All the teams within a division shouldn’t look like each other, they should be different. Who wants to wear the same color as your toughest rival? I’d rather see divisions with more variety, like the NFC North. Interesting, how things come full-circle. In 1977, all five teams in the AFC East (Colts, Bills, Dolphins, Patriots, Jets) had white helmets. By 1993, there were only two. Now there are three, out of four. Agreed. I like to see color variety in a conference. I like the AFC West and NFC East for that reason. I tend to associate the teams with color on their helmets with toughness (Chicago, Green Bay). Also, I wouldn’t put it past New England to change back to white. I guess the Dolphins are the only team in the AFC East that hasn’t gone back and forth…yet. Why are you singling out the NFC East? There’s no color duplication among any of the four divisions in the NFC. The whole reason the Bills changed to red helmets in the mid-80s was that all the other teams in their division wore white helmets, and the coaching staff felt it made it difficult for their quarterbacks to pick out receivers. It was a relatively controversial move in Buffalo — I remember one of the local TV stations, Channel 2, was pretty hepped up about the Bills trampling on tradition. The owl is a great mascot. Our local paper did a thing about owls the other day. One of the lines was “An owl’s diet is pretty much any animal smaller than it is.” Owls can get as big as housecats. That’s one tough bird. I remember that. It was Joe Ferguson, specifically, who threw 25 INTs in ’83 and a league-high 16 in the 9-game ’82 strike year. It didn’t help much; he threw 17 in 12 games in ’84, and the next year he was gone, replaced by Vince Ferragamo (which, I understand, translates to “Ferguson” in Italian…). Ferragamo lost his job to Bruce Mathison in mid-season; the two combined for 31 INTs in ’85. Of course, the Bills solved their QB problem the following year, thanks to the demise of the USFL…. My dad was a Bills fan when Jack Kemp was quarterback. My kid brothers were Bills fans in the Jim Kelley era. I got Gary Marangi, and Vince Ferragamo, and Fergy (who really wasn’t as bad as we were convinced he was). My kids ended up with JP Losman. We don’t like football much in our house. quiksilver is my FAVORITE brand!!! will be picking up the steelers version. jealous of your wife working for them too… SO cool! I used to play with Scott Carpenter in an over-30 hardball league in Cooperstown. He was very good; I wasn’t. I did get to try his mitt, though. Incredibly light. Scott told me, say 6 years ago, about his hopes to get an MLBer to wear a Carpenter mitt. I’m very happy for him. Packers ring ceremony is tonight, still waiting to see the design…. Tim O’Brien wins the Thrashers re-design contest. Hands down. Absolutely. I’m referring to his Manitoba Falcons concept. Yeah. When I listed Tim’s submission as #3 on my top-three list, I should have said that it was the best of the three. Kinda like Miss America, you know, with Joe’s Owls as second runner-up and Justin’s Falcons as first runner-up. Timbo knocked it out of the park in the swimsuit competition. Thanks guys. I hope others agree with you. Can’t wait for the ESPN column to go up. Regarding the professional redesign of the Thrasher’s, I think it reminds me too much of the Capitals’ jerseys. Same color schemes, and similar jersey types. Maybe living in Washington has made me prejudiced, but it’s all too similar. Two softball teams in the state of Maine play a color-on-color game … both teams in red. The only way you can tell one from the other is that one is sleeveless and the other has a white section where a UCLA stripe would be. Just curious about something from the game last night….why was Boston’s third goal allowed to count? It was a delayed penalty, and Boston sent the puck in, and Luongo goes down and cradles the puck with his stick….that ends the play…that’s possession. After the Boston player careens into him and the puck goes in the net is of little consequence. As soon as Luongo went down and cradled the puck with his stick, that was the end of the play. This was a huge mistake because 2-0 is very different from 3-0. Thoughts from anyone? Paul, can you check with Barry Melrose please? The shot on goal has to he stopped by the goalie. The rules are different for shots on net. Right call. The goalie has to have control of the puck in order for him to stop the play on a delayed penalty. I love everything about those Voyageurs unis, from the name to the polar bear logo to the colors. Among several terrific Falcons entries, Kuruc has for me the strongest execution. Great color scheme, and a logo that preserves the best qualities of the Thrashers’ logo (color blocks, no outlines, a sense of contained dynamism) but gives it a very “Canadian west” feel. Tim E falls a hair short of that excellence with a great idea that just misses the mark in a number of details. Tim E is, to me, one round of revision away from an all-time great concept. And mad props to Hick for combining a unique color scheme with such classic lines. Since the two I most wanted to vote for weren’t finalists, I voted for Hick’s Polar Bears entry. But I’m confident that enough others will vote for Giorgio’s excellent Jets treatment or Tim E’s terrific Falcons entry that one of them will win, and well deserved it will be. For those who are curious about how we made the sausage: Kurt and I each chose our 10 favorites. Four of them were the same, and then we sort of negotiated to settle on a fifth choice. That’s how we settled on our finalists. I’m so flattered to be a finalist! I actually wanted to do an alt with a threshing machine but couldn’t find the right image–I wish I could have found the one that you did. I did a mockup of a black alt with the Thresher dude, but it was too narrow on the sweater and didn’t look right. There were a lot of good ones there, but I think you guys got it right with the number 1 pick. I would buy that sweater, and I’ve not got any loyalty to Winnipeg or the ex-Thrashers. It doesn’t surprise me in the least that the entries from the Uni Watch faithful were so good, but I was definitely pleased at how nicely Kurt’s submission turned out to be. The nitpicker in me says that the blue’s a little darker than I’d like to see them actually wear, the pants could use some stripes, and of course, he needs to design some white socks to go with the white jersey. Other than those minor quibbles, it’s a solid effort. Kurt’s design wasn’t my favorite, but I really do think his little contrail detail was very, very clever. Yeah, it didn’t get my vote, but I considered it just because of that contrail hem stripe. And I think my daughter would like playing hockey even more if she got to wear this on the ice. Just once…the new team should wear that. C’mon guys, be the Butterflies for a day! Can’t stand alliteration, but I love moose, so I’d take the Manitoba Moose. If you took Christine’s design and called them the Winnipeg Walleyes, I could dig that, too. 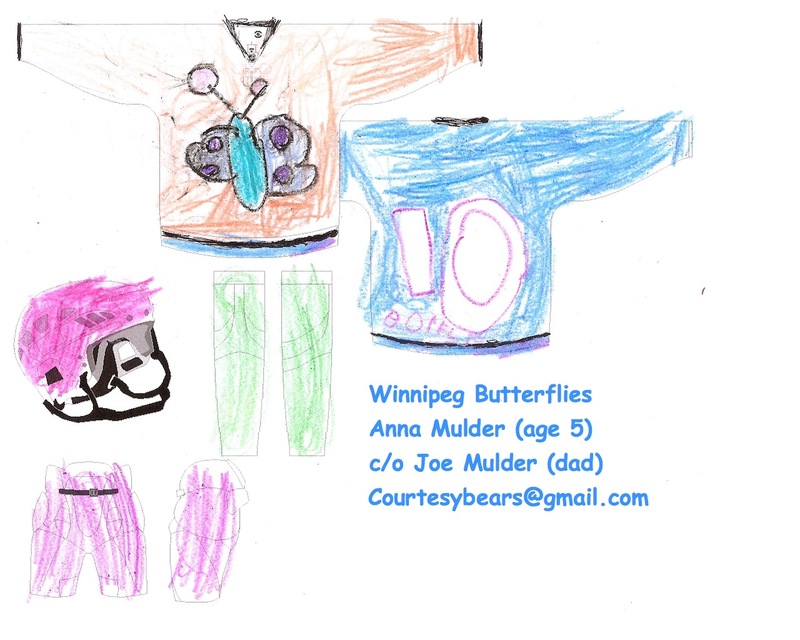 Honorable Mention to Anna’s Butterflies, Chris’ NY Jets-inspired unis, David’s Threshers and pretty much all the Winnipeg Jets designs. 5. Joe Csikos, Manitoba Owls. Love the color scheme, as well as the design. 4. Will McGillis, Winnipeg Blizzard. Gotta give props to a fellow member of the Crayola set. 2. Patrick Woody, Manitoba Jets. Grounded in reality (the name’s gonna be Manitoba, not Winnipeg), yet a good new design for an old nickname. And the bad one is…mine. Because in a contest like this, the only bad design is the one that you don’t bother to enter. /now on to more important stuff…Happy NBA Draft Day! They’re actually my second favorite, though, because the Davidson and Gundell proposal was fantastic. If I had any say with True North, I’d be arguing for that until they gave in or had me kicked out, whichever came first. I’d like to see either proposal take Snibbe’s contrail stripe idea on, though; that was a brilliant plan. I’m incredibly impressed by the uni redesign submissions. I knew when I made mine that it would get blown out of the water, and I was excited to see the designs that did. I was not disappointed. Great job everyone. Regarding the Nike-branded photog bibs, Notre Dame requires adidas-branded bibs for photogs in South Bend. Welsh sports bow ties on Tuesdays and always has a Magnum P.I. ‘stache, so I appreciate his input. Also, Bray always wears those soccer socks. Looks better than the pajama pants that everyone is wearing…but that isnt saying much. Thanks for linking my Bob Melvin bobblehead! Hum…flashing the microfiber. You are right, that does not seem right! My Easton ‘Stealth’ softball glove has Kevlar behind the fingers and the thumb – at least if I get shot – on the right hand – while playing the outfield – which is rare – i usually play 1st base, and use another glove, sans Kevlar – i’ll be ok! Why is it that when I clicked on the link to Federer’s sneakers my computer got a message that I was infected with a virus. Has this happened to anybody else? do you swear allegiance to the goddess nike? 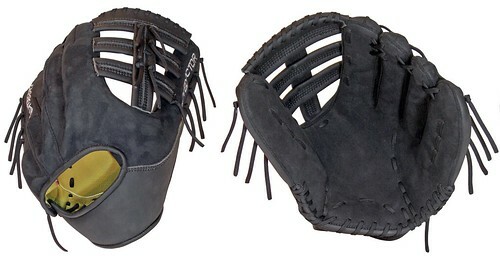 I’ve got to say that I’m a little taken aback that MLB has nothing to say about this synthetic glove. I honestly wonder if this paves the way for nontraditional materials to be used in making bats. That’s a good point, since the Official Rules specify in all instances that fielders may wear “a leather glove or mitt.” So as far as the rules go, there is no difference between an all-synthetic glove and an aluminum bat. I’d rather they tweak the ball (make it mushier) than tamper with the bats. That way the bats (and players’ skulls) would break less. Eh, I think it’s ok if he uses a microfiber glove. This is not ‘Nam, this is baseball. There are rules. I’m fine with non-leather gloves, but the rules require gloves to be leather. So that glove should not see the light of night on a playing field until the rules are changed. Which they should be. Heck, Section 1 of MLB’s rules is supposed to govern the minor leagues as well, so the glove should not have been permitted down on the farm, either, until the rule was changed. Sure, it’s nice to see an alt that isn’t red or a dark color, but does it really look better than this? Of course not. If they ditched the white tops, you’d get tired of that yellow one pretty quickly. I mean, it’s a nice shirt, but it’s a fairly flawed design. The white piping is completely unnecessary and really takes away from the overall look. They are both great, as are the green jerseys. Diplomatic…and true. I’m with Geeman. Great review of McFarlane’s new articulated baseball action figures. Even though it’s a Nats fan reviewing the Strassburg figure, he fails to note that McFarlane is still using an out-of-date number font, as they are with their unarticulated Strassburg. Interesting to see that in yesterday’s Vancouver riot, a large number of yahoos people are NOT wearing 200-dollar (100-toonie?) jerseys. pretty cool to see fraser davidson, one of my favorite illustrators, designing a hockey uniform. is it possible that he is a hockey fan? it would seem unlikely – he’s based in the UK, so i always thought he was british. check out the videos he illustrated for jedi thian’s ARC – some of the funniest videos on youtube. Snibbe’s crest and jersey design combo was the class of the bunch. It wasn’t quite all the way there, as far as the imagery inside the center of the crest. I think the design of the wings needs to be modified a small bit to better reflect those of the RCAF. Overall, though, that crest concept and jersey design was excellent, except for the jet contrail along the bottom hem, which I know quite a few of you really liked. It’s a bit corny, it’s ultra-modern (many people thought it was clever, I thought it was expected) and looks totally out of place on a uniform and crest that so perfectly vintage-inspired. Reminded me of a gimmick the NHL would have pulled during their sublimated 3rd jersey craze/campaign in the 90s. Very nice work, though. 8/10 as is, 9.5/10 without the contrail bottom hem. Not a fan of Snibbe’s concept. The logo is too close to the Red Wings. And the unnecessary maple leaf seems like an afterthought. The jet at the bottom is more annoying than anything else. One thing I do like is the hockey stick W logo. If 1970s Little League is, like, the best look ever, sure. Cuz that’s never been an MLB style. Lower the stirrups, guy (since tapering pants isn’t really an option these days). Sorry, men. In general, color top / white pants doesn’t make it. I know. We agree. But that particular yellow top, with that yellow-and-green at the bottom, is… well… the exception to the rule. What’s the yellow and green at the bottom of which you speak? In almost all photos of that game I’ve seen, there is yellow and green at the top, yellow in the middle and nothing but white below that. Seeing the A’s in gold jerseys just feels right. Kudos to them for keeping the green and gold, and for bringing back the gold jerseys for the first time in 25 years! Thanks so much for hosting this contest, I probably woulda done a concept or eight anyway but its great to recieve the attention you can bring to my – and the other contestants’ – work. Thanks! I really enjoy making concepts and I’m pumped to receive good feedback when I can get it. Lord knows it’s a grade C world, but you people inspire me to strive for grade A. And about the visor – The player in the template is Tazer (Jonathan Toews) but I didn’t want him to be that visible so I tried to make the visor a bit more opaque. In hindsight, even think I overdid it a bit, haha. 4) Connie, you’re my Irish homeboy. One Love. 5) JTH, you’re my Chicago homeboy. One Love. Thank you for all the feedback, inspiration and help you’ve given me over the past few months. Without you pushing me and befriending me, I’d probably still be writing stoopid blog posts about politics and sports rather than honing my graphic design skillz. How much did you say that cash prize was? Six Gs? Looking forward to the poll results to see if that bank is mine. 8) Personally I love Martin Hick’s Manitoba Polar Bears (I even mocked them up in my template the other day http://smg.photobucket.com/albums/v232/Timmacane/Uniform%20Concepts/polar%20bears/ ) and the other contestants did great work too. The “other” day? I thought it came out today. How did this happen? 1) the stripes on the whites should be of the Northwestern variety. 2) the breezers should have vertical and horizontal stripes. 3) the light blue jersey should have thinner maroon stripes. I know Paul’s Photostream address, I used to use it when I was tweaking NBA courts. Yeah, some of those inconsistencies were because i did those in a rush, but knowing now that America/Freedom hating StLMArty is the creator of those unis, I’m glad I didn’t get them right. Question: Did you think about turning the falcon upside down, creating a W with the bird shape? I did but mine forms an M for Manitoba. Very unimpressed with that Moneyball movie, they would have been better off with a ESPN documentary. Had those 2002 A’s experienced playoff success, and won the pennant, that would have been a compelling story. Unfortunately, new methods of evaluating players just isn’t exciting, as the clip of the walk reveals. In non-fiction material, you must have a big payoff for the viewer, and beating the Angels, Rangers, and M’s for a division title just doesn’t cut it. A much better, compelling, story would have been the 2008 Rays. “It’s more than a Super Bowl ring. It’s a ring for the ages. The four Super Bowl titles, the 13 world championships, the 92 years of franchise history, and the path taken by the 2010 Packers to add this chapter — it’s all in there. It tells an entire tale that marries the storied tradition of the Packers with their singular achievement in 2010. All in a ring? Sure, and it was done majestically and subtly at the same time. The ring’s square crest is highlighted by the ‘G’ logo — gold on a green setting, of course — but the overwhelming sparkle of the diamond-dominant presentation shouldn’t distract from all it incorporates. In each of the four corners of the crest, surrounding the ‘G,’ is a marquis-cut diamond, which is appropriately football-shaped, just like the one on top of the Vince Lombardi trophy. There are four of those for I, II, XXXI and XLV, the four trophies that will reside together forever in the team’s Hall of Fame. The shape of the ‘G’ itself consists of 13 diamonds, one for each title dating back to 1929, and surrounding the entire crown are 92 diamonds, one for each year the Packers have been in existence. That’s a lot cleverly depicted on the ring’s face, but that’s not the whole story. The sides, or flanks, of the ring continue the convergence of history with the present. On the one side that’s personalized for each player with his last name, there’s both an impressively carved image of Lambeau Field — a tribute to the best venue and fans in the NFL — and the player’s jersey number. Each number is circled, just like those on the third jerseys introduced this past year that represent the attire of the first title team in ’29. On the other side, underneath a logo-lettering of “PACKERS,” is a Lombardi Trophy, with the name of the iconic coach, the NFL shield, and an ‘XLV’ at the base, which captures both the specific game and a piece of its logo. Together, the primary images on the two flanks can be interpreted as the Lombardi Trophy being brought back to its home, Lambeau Field, which was done two days after the Super Bowl victory in North Texas in front of more than 56,000 fans who braved sub-zero weather to share in the glory. There’s additional context when the ring is seen next to the Packers’ previous three. It appears to fit with the collection, while simultaneously standing out as the one that represents more history than the others. Each ring builds on the previous one, with the latest edition the culmination, for now. The saga wouldn’t be complete without the “inside story” to the 2010 season, which is, fittingly, on the inside of the ring. The Packers became just the third team to win three road playoff games en route to a Super Bowl title, and the scores of all the postseason contests are engraved inside the ring. Also engraved inside are the numeral “1” along with the words “Mind, Goal, Purpose and Heart” — the very number and terms veteran cornerback Charles Woodson employed with such fervor in his memorable postgame locker-room speech following the NFC Championship in Chicago. The number and its accompanying characteristics also reflect the unity the Packers needed to overcome numerous obstacles in their path to the championship — countless injuries, back-to-back overtime losses, and a season on the brink with two weeks to go. As for the basics, the Super Bowl XLV rings are made of platinum, with 18-karat yellow gold, and weigh a little over 4 ounces. The diamonds total 3.35 carats.